Thomas Nail’s Lucretius I: An Ontology of Motion will be published in February of 2018 by Edinburgh University Press. Description below. Thomas Nail argues convincingly and systematically that Lucretius was not an atomist, but a thinker of kinetic flux. In doing so, he completely overthrows the interpretive foundations of modern scientific materialism, whose philosophical origins lie in the atomic reading of Lucretius’ immensely influential book De Rerum Natura. This means that Lucretius was not the revolutionary harbinger of modern science as Greenblatt and others have argued; he was its greatest victim. Nail re-reads De Rerum Natura to offer us a new Lucretius–a Lucretius for today. 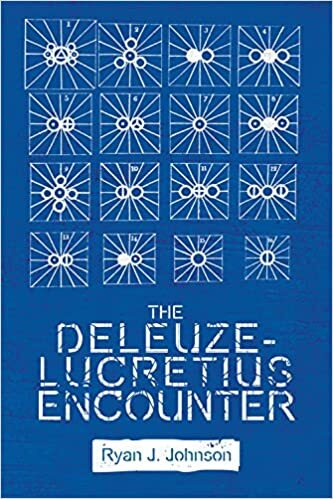 Explores how Deleuze’s thought was shaped by Lucretian atomism – a formative but often-ignored influence from ancient philosophy More than any other 20th-century philosopher, Deleuze considers himself an apprentice to the history of philosophy. But scholarship has ignored one of the more formative influences on Deleuze: Lucretian atomism. One of the most exciting features in Foucault’s work is his analytics of power in terms of forms of visibility. It allows for a reflection on the conditions of seeing and thinking, thus triggering a seemingly paradoxical move: locating the limits of our perspectives entails simultaneously transgressing these limits. In a way, we decipher our own blind spot. Approaching Discipline and Punish through this perspective brings us to identify the digital subject as a characteristic figure of our time. In contrast to its disciplinarian counterpart, it appears to be an active, though not necessarily political subject. The notion of visual citizenship will help us to go a step further and figure out what it could mean to challenge today’s surveilling gaze. My next book is about to come out. Published by Routledge, this is the summation of about four years of work I have been doing on the quantified self at work. The Quantified Self in Precarity: Work, Technology and What Counts is the state of the art text on how technology and the use of technology for management and self-management changes the ‘quantified’, precarious workplace today. Scholar writing as his desk. From Avicenna’s Kitab Al-Shifa’. I was searching for an English translation of a Karl Ove Knausgaard novel last week when I stumbled across this auction for a set of his My Struggle autobiographical series, Books 1-5, signed no less. The whole thing sounds kind of bizarre to me, especially because Knausgaard is a famous introvert.